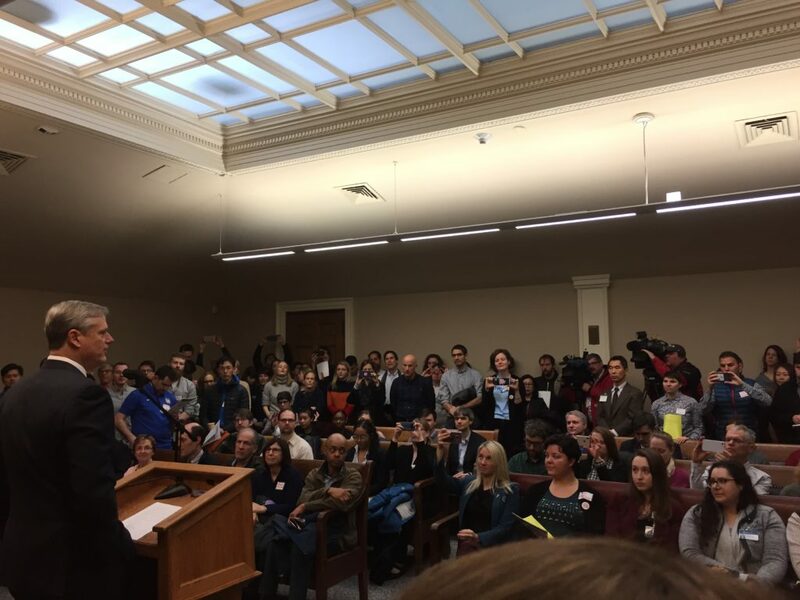 On Wednesday, we brought the message of Vision Zero to the State House when more than 150 people from across Massachusetts gathered for a Day of Action for Road Safety. There, we met with Governor Baker and legislators and asked them to support bills filed last week that would make roads safer for pedestrians, cyclists and all users. We had an amazing crew of Bike Union members turn out. To those who came: Thank you! If you were unable to attend though, you can still call or email your elected officials to help us hammer this message home. Lawmakers have hundreds of bills to consider each legislative session, and feedback from constituents helps guide which causes they choose to champion. The more support they hear from you before the January 31 House co-sponsorship deadline, the more likely they will be to sign on to and advocate for our top three priorities: hands free, automated enforcement, and a package of traffic regulations that includes side guards on all state-owned and contracted trucks. Visit Find My Legislator to identify your Massachusetts Representative and Senator and to find their contact info. Calling is best so someone can hear your story about why road safety matters to you, but emailing is effective as well. We can’t do this without you. Your voice and your story are critical to moving these bills forward. Thank you for taking time to make roads safer in Massachusetts! Hi, I am a constituent of Representative______/Senator _______ and am calling to ask for their support on 3 bills the Vision Zero Coalition is advocating for that would make our roads safer and prevent traffic deaths: Hands-Free Driving, Automated Enforcement, and An Act to Reduce Traffic Fatalities. Automated Enforcement Bill SD1461 would allow red light cameras and speed cameras to be placed in certain locations. Towns and cities could choose to opt in. Violations would include speeding, failure to stop for a school bus, failure to stop at a red light, and illegal turn on red. When enacted in other states, automated enforcement has reduced speeding and serious crashes. More than 400 U.S. communities in the U.S. use red light cameras, and more than 130 use cameras to enforce speed laws. Do you know if we can count on Senator____/Representative_______ to cosponsor any of these bills this session?